Families in Chab’il Ch’och’ look out over their burning homes during a forced eviction. Photo taken by a community member during the eviction. The war on Indigenous communities in Guatemala didn’t end with the country’s 1996 Peace Accords. It continues today in the form of land grabs. As Guatemalans commemorated the Day of the Dead on Nov. 1, several communities across the Northern Transversal Strip [Franja Transversal del Norte] – a territory marked for development that stretches from Huehuetenango to Izabal – faced an uncertain future. The end of October and early November saw three major evictions of Indigenous communities in the departments of Alta Verapaz and Izabal. The Guatemalan courts had declared the residents “land-usurpers,” and ordered their expulsion by the Guatemalan National Police. The first eviction began early in the morning on October 30, when the Guatemalan National Police arrived to small hamlet of Chaab’il Ch’och in the municipality of El Estor, Izabal, to evict the families that live on the land. Reports vary, but between 60-80 families were forcibly removed. The families watched from afar as police razed their community to the ground, burning their houses and what belongings they could not carry with them, mirroring the scorched earth tactics used by former dictator Efrain Rios Montt at the height of the country’s 36-year internal armed conflict. The eviction forced families to set up an improvised camp in the community of Qoeox Hä, where children are forced to sleep on the ground under plastic tarps. Initially the community was thrown into chaos as several families went missing after the eviction. But little by little the community members regained contact with the others as they emerged from the mountains. Residents of the small hamlet trace their presence on the land back to the early 1930s, when, according to Guatemalan investigative journalist Luis Solano, the community was registered under the name of Chinamachacas. Yet private property titles were issued to people outside of the community, and the land was taken from beneath their feet. The community of Chaab’il Ch’och sits on a finca called Santa Isabel, which was acquired by a shell company owned by disgraced and currently imprisoned president and former member of the military’s elite Kaibiles Otto Pérez Molina. During the height of the country’s bloody conflict which killed over 200,000 mostly Indigenous Guatemalans and displaced hundreds of thousands more, the Kaibiles were responsible for the massacres and destructions of hundreds of Indigenous communities. The finca is currently being administered by Rodrigo Lainfiesta, a businessman and ally of Pérez Molina, who also is facing corruption charges. As both Pérez Molina and Lainfiesta face await justice, the landless Q’eqchi’ families launched an occupation of the finca in December 2016. 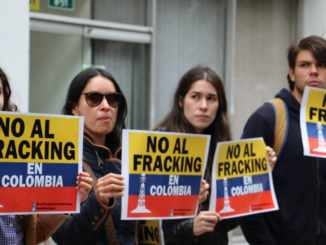 They demand that the government confiscate the land and provide the funds to purchase the land through the Fondo de Tierras, or the Land Fund. Following the country’s 1996 Peace Accords, the Guatemalan government established the Fondo de Tierras to provide loans to communities to purchase lands in order to resolve the historical land inequalities. Though, in the 20 years since the end of the internal conflict, the fund has instead begun to provide a means for the reconcentration of lands into a small handholding elite. For instance, it is estimated that today nearly 80 percent of land is owned by 3 percent of the population. The residents are supported by Guatemala’s national laws, specifically the Ley de Extinción de Dominio, or Law of Extinction of Domain, which was established during the administration of Alvaro Colom in 2010 through Decree 55-2010. The law permits for the expropriation of any assets of anyone convicted of a crime, including narco-trafficking or any criminal activity. Residents argue that Pérez Molina and his associates were looking to use the land as a drug trafficking route. But this was not the end of the tragedy. Two other Q’eqchi’ communities, La Cumbre Chamché and Trece Aguas in the department of Alta Verapaz were evicted just days later. On Nov. 1, the 25 Q’eqchi’ Mayan families that lived in the hamlet of La Cumbre Chamché in the municipality of Tactic, Alta Verapaz, were also forcibly evicted from their land. According to reports from Unión Verapacense de Organizaciones Campesinas (UVOC), the community had been in negotiations with the La Secretaría de Asuntos Agrarios de la Presidencia de la República (SAA) in order to resolve the long-standing conflict over the land prior to the eviction. Following the Liberal reforms in 1871, the residents of the community had been transformed into a slave labor force, known as mozos, for the landowner. The community members were working with the SAA at the time of the eviction to gain the rights to the land. The families of La Cumbre Chamché were left without any means of survival following the eviction. They established a makeshift camp, but faced more hardships due to cold temperatures and rain. The evictions came around the time when communities across Guatemala were preparing their family celebrations for the Day of the Dead on Nov. 1, as well as in the days after. This tactic is regularly used in evictions. The evictions have been denounced by both social movements and left-wing members of Congress. In a press conference on Nov. 3, Congressional representative Leocadio Juracán of the left-wing Convergencia party called on the United Nations backed International Commission Against Impunity in Guatemala (CICIG) to investigate the interests behind the evictions. The continued conflict over the land and threat of eviction has worsened the problem of rural poverty. According to data from the World Bank, poverty has grown from 56 percent in 2000 to over 60 percent today. The department of Alta Verapaz has the highest level of poverty, and is the department with the highest levels of agrarian conflicts. 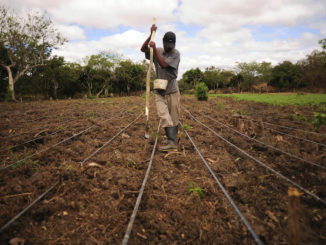 To make matters worse, in their website promoting investment in Guatemala the Guatemalan Ministry of the Economy promotes that 88 percent of arable land is available for investment. But this does not take into account Indigenous communities that reside on the land. The expansion of export crops such as African palm oil and sugar cane, and energy and mining activity, is especially concentrated in the department of Alta Verapaz. 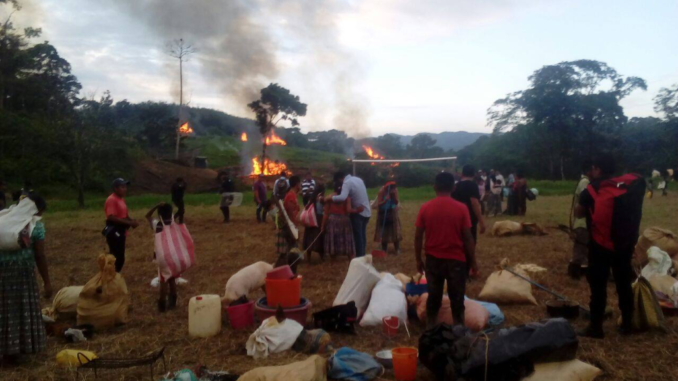 On Nov. 3, the 18 families that resided on part of Finca Trece Ríos in Nuevo Sumey, Senahú were violently evicted from the finca where they resided. The finca owners, brothers Godofredo and Fernando Von Quednow, had requested their eviction within the Public Prosecutors office. The families were forced to set up an improvised camp along the road. But the violence did not end with the eviction. Late at night on Nov. 20, private security employed by the finca arrived at the improvised encampment to once again evict the families. The extrajudicial eviction was unsuccessful. Hours later, the security forces returned again and opened fire against the campesinos, killing Emilio Toc, and injuring two others. The ongoing eviction of Indigenous communities continues to draw intense protests across Guatemala. Residents of Santa María Cahabón marched through Guatemala City on Nov. 8. The hundreds of protesters demanded an end to the construction of the Oxec I/II hydroelectric dams, and they expressed their anger toward the continued eviction of Q’eqchi’ Mayan communities for private interests. The community of Chaab’il Ch’och has grown close with the communities of Santa María Cahabón. They see their solidarity as being part of the same struggle. As the residents of Cahabón marched, Members of the Campesino Development Committee (CODECA) blocked highways on Nov. 7 and 8. The campesinos associated with CODECA were demanding the resignation of President Jimmy Morales due to allegations of illicit campaign financing, as well as an end of the evictions of Q’eqchi’ campesinos. The campesinos faced intense pressure to lift the roadblocks. These tensions erupted in multiple accounts of violence against the protesters. On the morning of Nov. 7, Antonio Perez de León, a 65-year-old member of CODECA, was stabbed to death as he left his house in the community of Chichop, San Antonio Ilotenango, Quiché. According to the press release from CODECA, he was on his way to one of the roadblocks. In another incident, a protester was struck by the truck of a local landowner at one of the roadblocks in the department of Izabal. The victim, who is identified as Vicente Calderon, was brought to the local hospital in critical condition. Blocking the main throughways is one of the few means campesinos have to demonstrate their frustration with the administration and the continuation of violent evictions. But as the campesinos protest the latest evictions, a new law being proposed in the Congress will classify the blocking of a highway as a form of terrorism. “All typical, unlawful, guilty and punishable conduct that causes intimidation, anxiety, alarm or fear in the population or sector of the same (…) that threatens the health, liberty and safety of people or heritage, affecting public buildings, roads or means of communication or transportation of any kind, power or transmission towers, motor installations or any other good or service,” cites article 4 of the initiative, according to a report from the Guatemalan daily Newspaper, Prensa Libre. 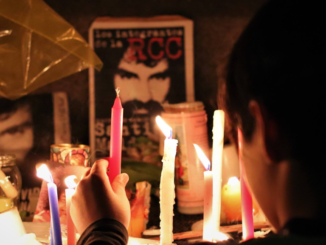 The new anti-terrorism law arose following a deadly attack at the Roosevelt Hospital on August 16, where gunmen killed 7 people in an attack on one of the few public hospitals in Guatemala City. This represents new attempts by the Guatemalan government to criminalize social movements across the country. This especially worsens the situation of communities facing eviction from their lands for private interests as it strips the communities of the means to express their dissatisfaction with the status quo in the name of combatting terrorism. Defending land in Guatemala may now become even more dangerous.